1. I missed the online registration deadline and paid a $15 penalty for registering during packet pick up the day before the race. 2. Pre race dinner consisted of an Eggland’s Best omlette stuffed with sage sausage, bell peppers, onions, tomatoes, and American Cheese. It wouldn’t be right with out cheese grits and wheat toast on the side. 3. No special planning for my race fit. The 2014 race shirt was pretty snazzy. Some consider it a big No-No/bad luck to run in the race shirt on race day and I believed that up until today. 4. I munched on Saltine crackers from the time I left home until I parked in the Green Lot. 5. No gear check for me! I wore a hoody with all intentions of gear checking that bad boy. “The Hawk” (the wind) was only going to get worse through those Iroquois Hills. Running in a cotton hoody vs. my cutesy, thumb cut out running jacket was definitely a change from the layering norm. 6. I held my Otter box protected Galaxy 4 in my hand the entire way. I knew I wasn’t running with a time goal, just for fun so why not snap it up. 7. I slowed and walked through every water stop. Normally, I would would knock out 10 miles with one or two sips. 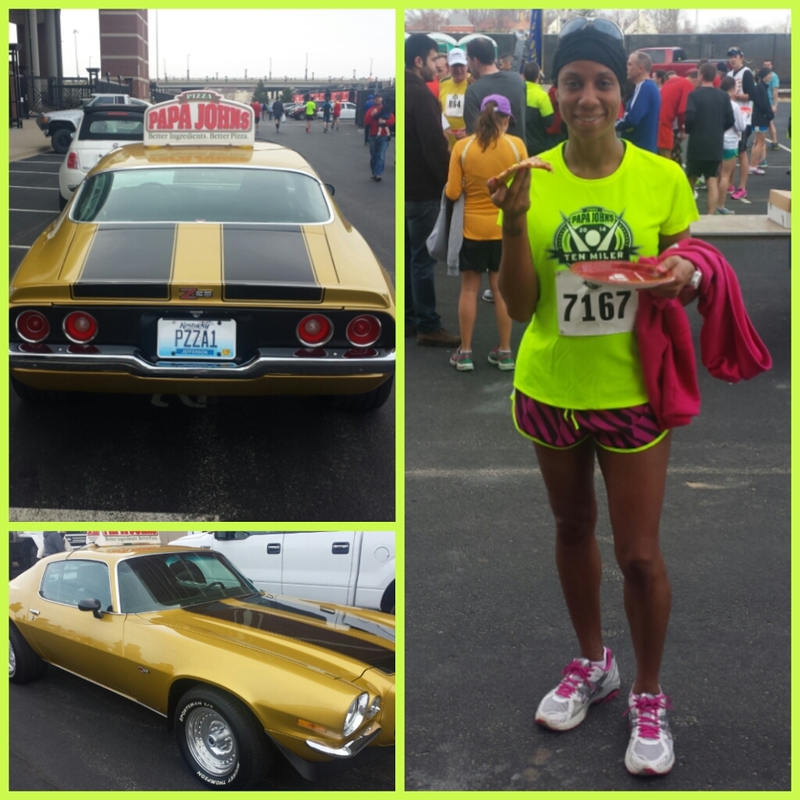 As it turns out, my unsystematic approach to my 2nd running of the Papa John’s 10 Miler did not hinder my experience or performance. It was nice to see my Running group buddies: Lori, Jess and Rhonda. I haven’t ran with them since Nov/Dec. When I was coming out the last hill of Iroquois, I saw Emelia and told her how much I’ve missed spin class. I hope to be back to morning workouts soon. 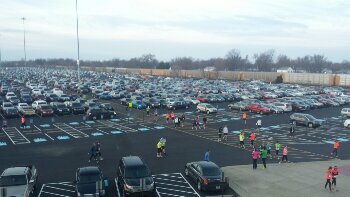 In conclusion, I absolutely love the Papa John’s 10 Miler race. The route is scenic, the volunteers are fabulous and the best part…PIZZA! 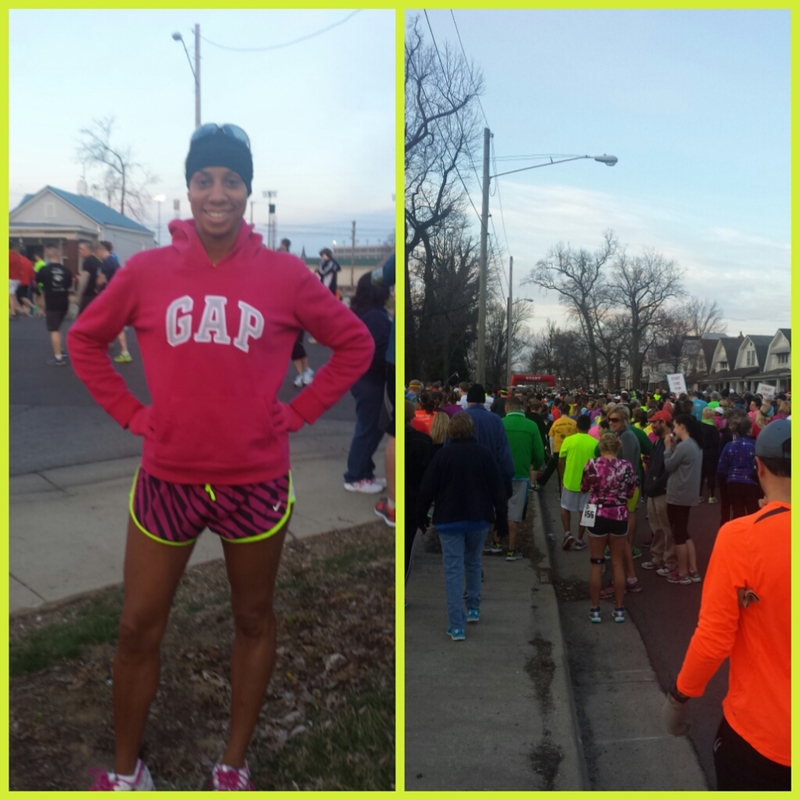 About 4 minutes slower than last year but much more fun this time around! Slowest mile= 9:18 at mile 1. 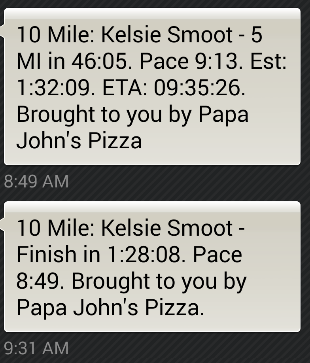 Fastest mile= 7:43 at mile 7. 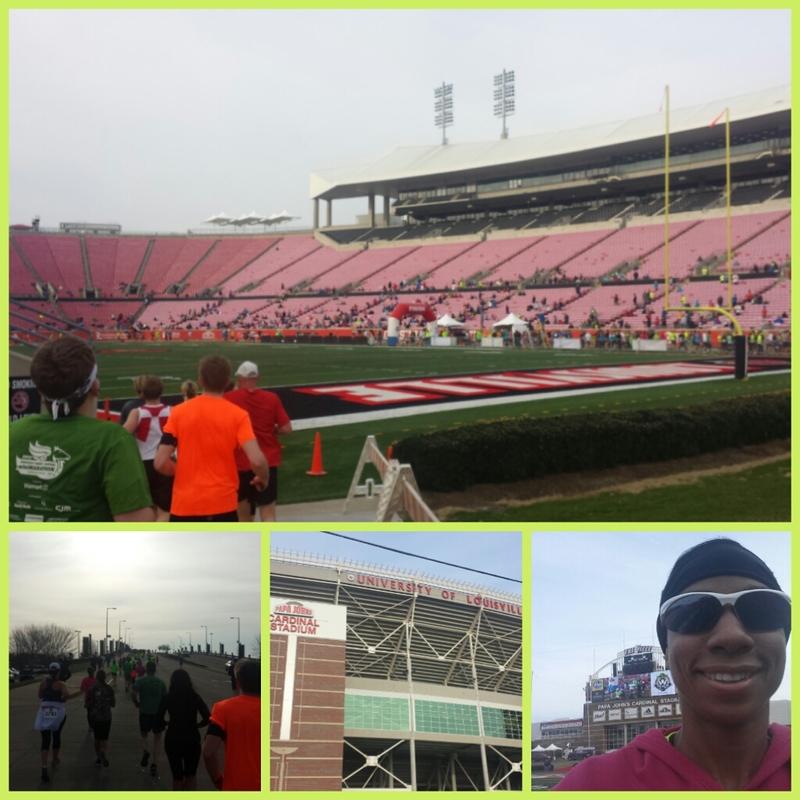 This entry was posted in fitness, Louisville, running and tagged Papa John's 10 Miler, Triple Crown of running. Bookmark the permalink. Girl I don’t do gear check either! Such a hassle! 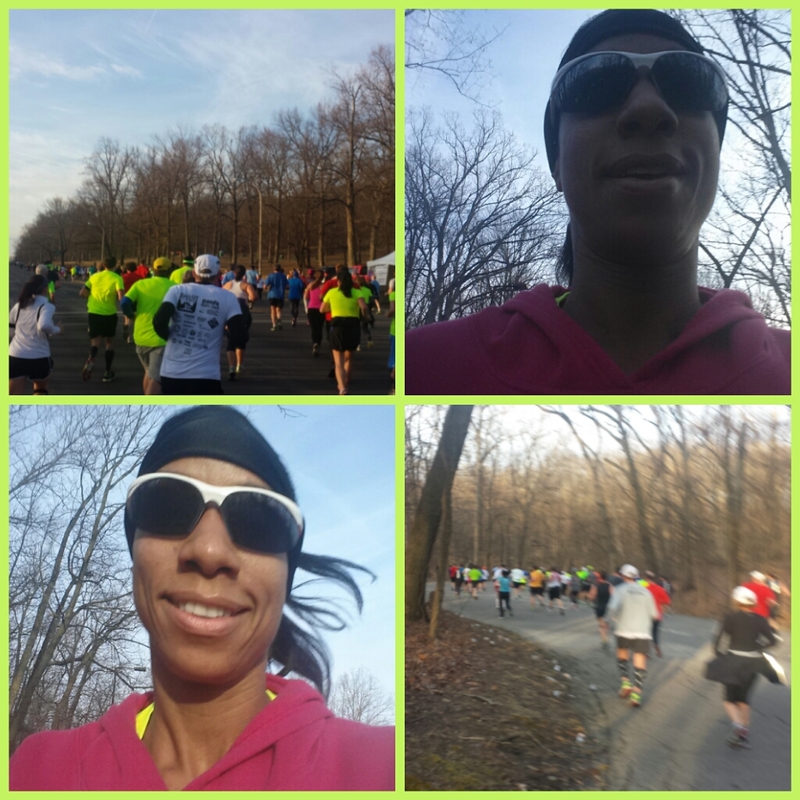 I’d rather just be in and out – haha nice job on the 10 miler! One of my favorite distances!! Congrats on a good finish. It shows how staying fit allows you to do great things on a regular basis. We have missed you in class but know you will be back when you are able. Thanks Steve! I really miss spinning. I hope I can up when I return! Good on you for enjoying the race and STILL posting a great time! I don’t know how you take such good pictures while you run. Whenever I try to do that, they just end up being blurs. PS – I love the shirt! Thank you! They did real good on the design and color of shirts this year. Definitely something I will wear on solo runs for high visibility. I was surprised the photos were clear. Sounds like you found the sweet spot for running a race. Running for fun is absolutely the thing done right! Great run! Thank you! It takes a lot of pressure off when you just go out and have fun. LOL! It all turned out for the best! Glad you were able to enjoy it! Congrats! I have learned my favorite races are the ones I don’t race. I miss so much when I just push my pace. 😀 Congrats. Glad you had a good run. Thanks Karen! The farthest I’ve ran outside has only been 4-5 miles this year so I am well pleased with how everything went, especially Iroquois. That’s better than me. LOL!! But you always rock it, even when you’re not trying. You inspire.